Not content with a “total ban” on Muslim schools, Ukip leadership candidate Lisa Duffy now wants to ban Muslims from wearing burqas; those Darth Vader-like cloaks which some Muslims believe are ordained by Allah to cover women from head to toe because no part of their body may ever be seen by male eyes, other than those of their husband, son or pet cat Ja’far. Ms Duffy isn’t, however, proposing a total burqa ban: Muslim women would still be free to wear them in the bath or cooking a halal burgers in the back garden. It’s to be a partial ban: just in public – shopping centres, buses, trains and London Underground. You know, those places where people tend to get stabbed or bombed. To be fair to Lisa Duffy, another Ukip leadership hopeful Bill Etheridge also wants to ban burqas, but nobody bothered much to report what he said when he said it. Perhaps it’s because he doesn’t want to a total ban on Muslim schools as well. But it’s a bit rich of him to accuse Ms Duffy of “chasing the bigot vote” by focusing “on small issues like Islam which makes us look small-minded”, and then to come out with his own manifesto pledge to ban burqas, which makes him look just as small-minded as Ms Duffy (though perhaps far more inattentive, for Islam is by no means a “small issue”). Except, of course, that by limiting what Muslim women may wear in public, you deny them the equality you claim, and remove from them “the same freedoms that you and I both share”. It’s difficult to know what Lisa Duffy and Bill Etheridge are playing at with these announcements, for it is the most colossal distraction from their core raison d’être, which is, post-Independence Day UK, to ensure that Brexit means Brexit. One would think that advocating any other policy which may be a cause of division in the increasingly fractious ranks of their party might be a sure path to self-destruction. Ukip should be concerned solely with Brexit and the restoration of a parliament made up of the directly-elected representatives of a sovereign people. In the words of (Sir) Lynton Crosby, everything else is just barnacles on the boat. A notion of liberty which stipulates which garments may or may not be worn in public soon turns to limitations on free speech and the banning of books. There is no doubt that some Muslim women are oppressed, and no doubt that some garments present a security risk. But some Muslim girls are equally coerced into wearing hijabs, and Islamists don’t generally seem too bothered about hiding their faces from security services or CCTV cameras. Martyrs-4-Mohammed tend to want the world to know who they are, if only to ensure the propagation of their cult. European Christendom has an emerging problem with Saudi-Salafism, but Islamism and Islamophobia have got nothing on Islamomania. And Islamomania is what is driving the sorts of illiberal knee-jerk demands of Geert Wilders, Lisa Duffy and Bill Etheridge (who also, incidentally, wants to ban halal and kosher slaughter, so there’s another “small-minded” policy which is sure to bolster Ukip’s Jewish vote). If this were an attempt to broaden Ukip’s appeal and address the genuine concerns of disaffected white working-class voters, they need to explain how criminalising (fining or imprisoning?) hundreds of Muslim women is going to create “a well-rounded community, a community that has an opportunity for all”. Isn’t it rather more likely to sow social discontent and breed more resentment? You may demur and insist that burqas are cultural garb rather than religious expression, but who are you? Who made you theologian-judge and divine jury over what garments are desirable for spiritual style or necessary for religious piety? It is not a burqa which is incompatible with Britain’s values of freedom and democracy, but the banning thereof. Unlike French laïcité, which inclines naturally toward such prohibitions, the United Kingdom has no tradition of the imposition of a hard secularism. We have instead three tortuous centuries of progressive freedom of religion, and that freedom was hard-won. The proper operation of democracy begins with the people, and the collective is constituted of individuals, and these individuals must be free think, free to speak, free to associate and free to wear what they wish to wear within the limits of public decency. 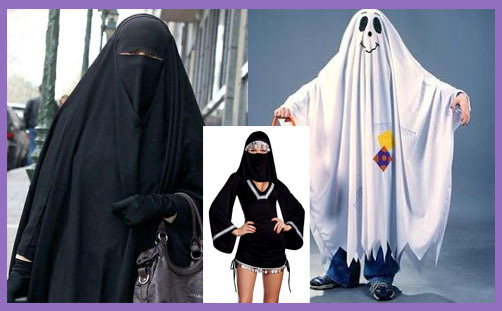 If one wishes to ban the garments of those who wish to cover their faces for religious reasons, one will also need to ban the ghost costume worn by thousands of children at Halloween. In a free society, one must be at liberty to choose not to conform. The liberty to conform only to the dress code and outward expression of religion as determined and defined by Ukip is no freedom at all: it is intolerance, oppression and tyranny; it is everything that Ukip professes to hate about the EU.